Stourbridge Lion, Baltimore & Ohio Railroad Museum, Baltimore, 12 October 2010. The Stourbridge Lion was built in Stourbridge in 1828 by Foster, Rastrick & Co for the Delaware & Hundson Canal Company. On 8 August 1829 it became the first locomotive to operate in the Western hemisphere, but was too heavy for the track and never entered regular service. 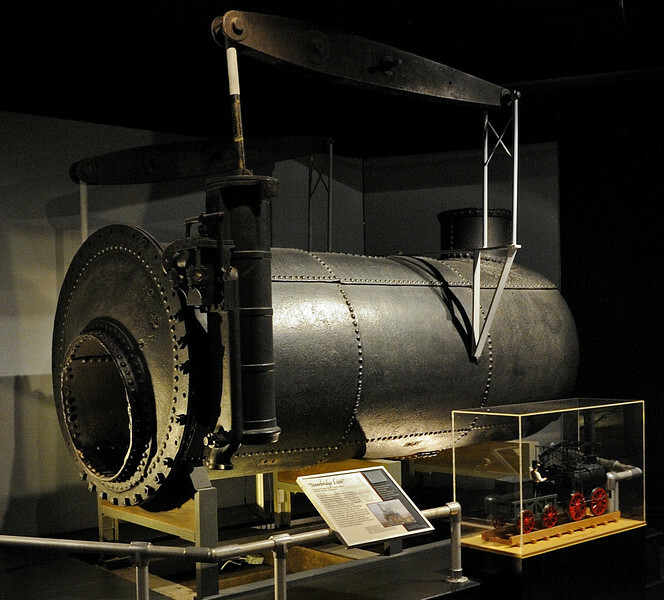 Stourbridge Lion was very similar to Agenoria, but only the boiler, one cylinder, seen here alongside the firebox, and two beams have survived. The loco was on loan to the Baltimore & Ohio Museum from the Smithsonian Institution in Washington DC. In 1932 the Delaware & Hudson RR built a replica of Stourbridge Lion, which is now at Honesdale, Pennsylvania.